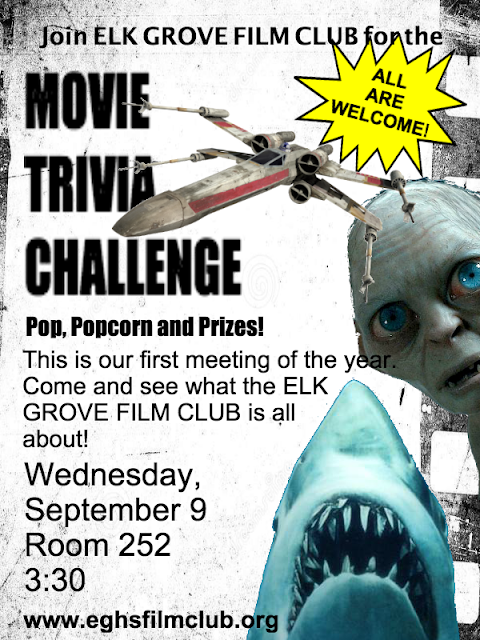 Elk Grove Film Club: Welcome to the 2015-16 School Year! I new year is beginning here at Elk Grove High School. So that means a new year of movies, trivia, screenings and, of course, the 2nd annual CinéStudent Film Festival. Our first meeting will be on Wednesday, September 9 at 3:30 in Room 252. We will talk a little about some of the plans for this year and then play the "Movie Trivia Challenge" for prizes! Pop and popcorn will be served. See you there!